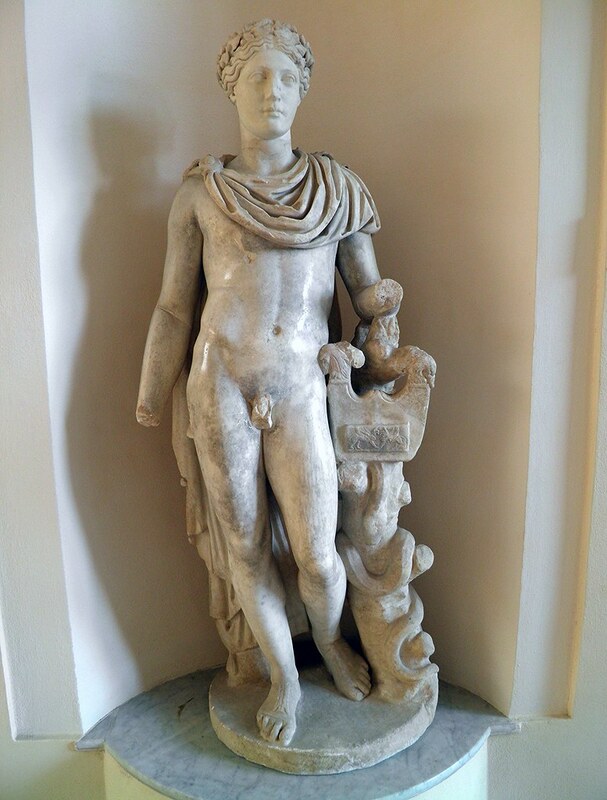 This week’s sculpture from Hadrian’s Villa is a marble statue of Apollo (Apollo Citharoedus). It was found on the site of the round Temple of Venus (tholos) by the 18th century owner of the Villa, Conte Giuseppe Fede. The god is depicted with his attributes; the lyre and the sacred snake Python. The tree trunk around which the snake is wrapped is inscribed with the words “Apollonios made it”. The statue dates to circa AD 150 (during the reign of Antoninus Pius) and was restored circa 1790 (Item number IN 1632). Handsome beast isn’t he. Thanks Carole love your photography. I like these pictures because they’re from the museum and you couldn’t take pictures in the Museum when I was last there. This fills an important gap on the site. I put the label ‘Carole Raddato, 2013’ on the photo itself. This can say anything you want (perhaps you prefer ‘CaroleMadge’ ?) and I didn’t know the real year that you’d taken the photo. If you want to change this then let me know. “This image is by Carole Raddato and was found here: http://farm8.staticflickr.com/7004/6681385241_5d5c860a42_b.jpg. I also used ‘carolemadge’ as a search term for that picture. If that’s satisfactory then I’ll leave it as is. Otherwise it can say whatever you wish. The new PHOSPHOR-OSTIA site has the potential to be a significant resource for Ostia scholars. Your photos will be an important part of that. Have you been travelling recently? Time for another interview? He has a face like Alexander! Reblogged this on Gay Saint Sebastian.